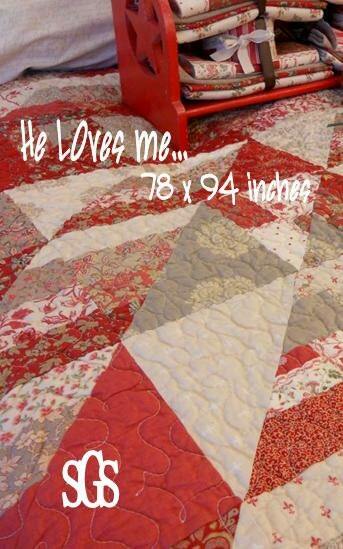 He LOves me quilt is 78 x 94 inches. It has clear directions printed in black and white along with a color front printed on cardstock paper. Pattern is held together with a metal brad paper fastener instead of a plastic bag. Pattern is bed-sized pattern that uses a layer cake and jelly roll and a little yardage for border and binding. It features a linen piping strip. Lovely pattern, easy read. Prompt delivery by email.